Mennonite churches in Elkhart and Lagrange counties in 1955. 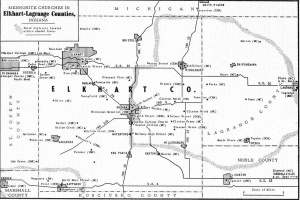 Elkhart County, Indiana, the center county in the northern tier of Indiana counties on the Michigan border, is the seat of one of the largest concentrations of Mennonite and Amish populations east of the Mississippi. The total of 43 organized congregations with nearly 8,800 members was distributed in 1950 as follows: Mennonite Church (MC), 17 churches with 4,200 members; United Missionary Church, 10 churches with 1,400; Old Order Amish, 7 churches with 600; General Conference Mennonite, 3 with 700; Conservative Amish Mennonite, 2 with 425; Old Order Mennonite, 2 with 250; Amish Mennonite, 2 with 250. Expansion into Lagrange County on the east and St. Joseph County on the west added 28 additional churches, to make a total of 71 with 11,000 members (1953). Two large Old Order Amish settlements with a total of 2,300 members are included in the above figures, the larger being that east of Goshen and reaching well into Lagrange County with 1,600 members in 23 congregations. The first Mennonite settlers came from eastern Ohio in 1845, locating west of Goshen in the Yellow Creek district. The first Amish contingent arrived in 1841, locating east of Goshen in Clinton Township. The county has been the scene of several schisms: (1) the Old Order (Wisler) Mennonite of 1871 west of Goshen; (2) the Brenneman (United Missionary Church) of 1874 in the same area; (3) the Progressive Amish vs. Old Order Amish, east of Goshen about 1860-65; (4) the Central Conference group in 1892 at Silver Street; (5) the similar schism in 1924 at Nappanee, Middlebury, Topeka, and Goshen; (6) the Burkholder Amish in 1948. The county since 1894 has been the seat of Elkhart Institute-Goshen College and of the Mennonite Board of Missions and Charities (Mennonite Church) since 1892. It has always been a strong center of Mennonite life and influence. Weaver, A. E. A Standard History of Elkhart County, Indiana, 2 vols., Chicago, 1916. Bender, Harold S. "Elkhart County (Indiana, USA)." Global Anabaptist Mennonite Encyclopedia Online. 1956. Web. 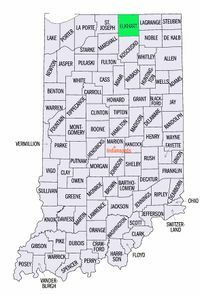 26 Apr 2019. http://gameo.org/index.php?title=Elkhart_County_(Indiana,_USA)&oldid=113780. Bender, Harold S. (1956). Elkhart County (Indiana, USA). Global Anabaptist Mennonite Encyclopedia Online. Retrieved 26 April 2019, from http://gameo.org/index.php?title=Elkhart_County_(Indiana,_USA)&oldid=113780. Adapted by permission of Herald Press, Harrisonburg, Virginia, from Mennonite Encyclopedia, Vol. 2, p. 186. All rights reserved.